A Canada goose swims on Sandra Pond. Hear the honking, look to the December sky, and watch the Canada geese flying south in a V-shaped formation. But what about the handful of Canada geese that you've noticed on the pond nearby, or perhaps on Mill Pond, Sandra Pond, or Lake Chauncy? Are they leaving too? It depends. These days we have two groups of Canada geese (Branta canadensis) in Massachusetts. Many geese come down from Canada at this time of year, stopping over or passing through as they migrate to parts much farther south. Later in the winter or spring they'll migrate back to Canada to breed, and we'll again spot the noisy V-formations, this time flying north. 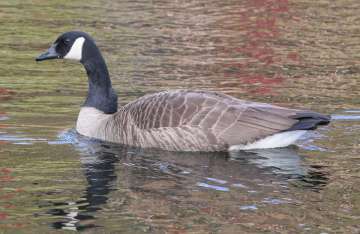 Other Canada geese are year-round local residents. They've lived in Massachusetts for generations and have lost their urge to migrate. These Canada geese breed here instead of going back to their ancestral homeland in Canada. They may move around a bit locally but they don't migrate. As their name implies, Canada geese are not native to Massachusetts. They live much of the year on the open tundra of Canada, where they breed and feast on fresh vegetation. When Europeans first arrived in Massachusetts, the land was closed in by forests and did not attract geese. Over time, people not only cleared the land for farming and later for development. They also created farm ponds, mill ponds, and, more recently, reservoirs. With a more open landscape dotted with more bodies of water, Massachusetts started looking better to the passing geese. What's more, people here did what amounted to advertising. Hunters prized Canada geese for their large size—up to 18 pounds, not bad for the Christmas goose. Some hunters adopted the European practice of using live decoys and brought in tame Canada geese to attract the wild geese that flew overhead. For this purpose they acquired Canada geese from captive flocks in other states. When the use of live decoys in hunting was outlawed in 1935, many tame geese were released. Our resident goose population had gotten its start. As changeable as our New England weather tends to be, it's less treacherous than the potentially harsh spring weather that the geese face when they try to breed in northern Canada. Not surprisingly, our resident geese have had great success nesting and raising their young. These local geese have flourished and multiplied, even to the point of becoming pests in some places. In large numbers, the resident Canada geese can make a mess of beaches, parks, and golf courses with their droppings. (Fortunately, Westborough's golf courses, the Westborough Country Club and Indian Meadows, report no problems with geese.) Flocks of geese sometimes consume crops. State wildlife officials have been working to control the burgeoning resident goose population by making frequent adjustments to the goose hunting season and hunting limits. The idea is to allow hunters to take about one-third of the resident goose population each year and to largely spare the migrating geese. By putting bands or collars on geese, wildlife officials can track the birds' movements and monitor population size. Most of us will watch geese rather than hunt them. Male and female Canada geese look very similar, although males are slightly larger. This similarity of the sexes is often typical of birds in which both sexes care for the eggs and the young. Pairs stay together for a year or more, possibly for life. Geese nest on the ground near the water's edge, sometimes on islands, laying four to six eggs in March or April. After about a month, downy golden goslings peck their way out of the eggs with a special "egg tooth" on their bill and are ready for action. Within 24 hours they leave the nest, able to swim, feed themselves, follow the parents and stay together as group. Both parents defend the goslings and can be quite belligerent, hissing and honking and using their beaks and large wings as weapons if necessary. Family groups may stay together for more than a year. Canada geese are largely vegetarian, dining on land or in water. As you know if you've seen them grazing in a grassy area, they get around by walking as well as by flying and swimming. They pick grasses and strip seeds from plants with their beaks. In a pond they tip themselves, head down and rump up, to take aquatic vegetation from the bottom. Canada geese can't always fly. In late summer they molt, shedding their flight feathers and growing new ones, as their bodies prepare for migration. For a few weeks they are flightless. Historically, native peoples of northern Canada hunted them during this period. These days Massachusetts wildlife officials use this time to catch resident geese and put bands or collars on them. The distinctive V-formations of migrating geese provide them with some advantages. For one, each goose can see where it is going, since its nearest neighbors are ahead and to one side and behind and to the other side. Mid-air collisions are also less likely. In addition, the aerodynamics of the V-formation may help the long-distance travelers conserve energy. The air flowing over one goose's wings and swirling off its wingtips gives the next goose a little extra lift. Only the leader, at the point of the V-shape, doesn't get this benefit.